The Cabin In The Woods video quality is suburb. There is obviously some green screen bleed though and the backgrounds look terribly fake which is unfortunate but sometimes an unforeseen issue with a 4K transfer. Some of the best horror movies take place in remote locations cut off from civilization. Just from its title, you know The Cabin in the Woods is that kind of movie - at least it seems so from the onset. From the brain child of Joss Whedon (Firefly) and Drew Goddard (DareDevil), the movie chronicles five college students who plan to spend the weekend at a relative's cabin. Of course, the weekend doesn't go according to plan as they are terrorized and killed by an unknown force but this movie offers up an interesting twist that is interesting until the end. Dana (Kristen Connelly; The Happening), Curt (Chris Hemsworth; Thor), Jules (Anna Hutchison; Spartacus: War of the Damned) Marty (Fran Kranz; Dollhouse) and Holden (Jesse Williams; Grey's Anatomy) all pack up for a weekend at Curt's Uncle's Cabin. Each represents a different character (to be revealed at the end of the movie) – respectively the virgin, the athlete, the whore the joker and the scholar. Things seem to be a little weird but ok as the five settle into partying the weekend away. After some drinking (and pot smoking on Marty's part) they find a storage basement full of eclectic and creepy items. When Dana reads a journal, things change and they are running for their lives from a family of zombies. What they don't know is there are darker forces at play beneath them. Hidden in an underground bunker is a team of individuals orchestrating their deaths in the name of survival of the human race. Sitterson (Richard Jenkins; Jack Reacher) and Hadley (Bradley Whitford; Get Out) watch a wall full of monitors and run a control panel creating the scenarios leading to the college students' deaths. With sights all over the world, one must succeed to appease the vengeful gods who live below and stem the attack they will wage on the world if things fail. However, Dana and Marty figure out what is going on and unless all kinds of horrors in the bunker killing everyone down there. As with other Whedon productions, things aren't always as they seem and while it's a serious story, he and Goddard infuse some humorous moments into the script. A unique horror story, they offer something new and fresh while still engaging us in the familiar plot of teenagers getting killed but something that isn't human. Goddard does a very good job in his directorial debut with an assist from Whedon I'm sure. The cast is great and fit into their roles convincingly. It was weird to watch Hemsworth play such a typical movie role after having had great success as the larger than life Thor. Connelly is probably the best amongst the group and Williams does a nice job as the brainy guy being set up with Dana. I love Whitford so watching him is always a treat and he and Jenkins blend well together as a team. The Blu-ray combo pack has the 4k, regular Blu-ray, and digital code. The 2160p video quality is suburb except when the characters make it to the bunker and unleash all the supernatural creators living below. There is obviously some green screen bleed though and the backgrounds look terribly fake which is unfortunate but sometimes an unforeseen issue with a 4K transfer. The Dolby Atmos audio is always a treat and this feature doesn't disappoint. The dialogue is clear and the sound effects fill the side speakers nicely. The discs offer several extras including Audio Commentary with Goddard and Whedon, The making of the movie, a look at the visual effects, makeup and animatronics, a humorous piece with Franz discussing the "stash of pot", a WonderCon Q&A, and a Theatrical trailer. The Blu-ray also has a bonus view mode. As horror films go, this one has a vision and some funny moments and pulls it all off nicely until the end. The bank vault of monsters, "appeasing the Gods" plot and the consequences of not succeeding are rather cheesy. However, a great cameo by Sigourney Weaver (Alien) as the Director makes up for some of the shortcomings. A new cult classic in the making, this is a movie worth owning. 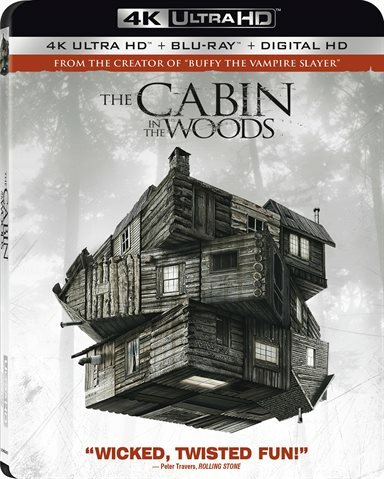 Download The Cabin In The Woods from the iTunes Store in Digial HD. For more information about The Cabin In The Woods visit the FlickDirect Movie Database.